Stockholm isn’t short on talented chefs and excellent restaurants serving up a wide variety of cuisine…but Chef Magnus Ek and his restaurants Oaxen Krog & Slip rate high on practically everyone’s list. Chef Magnus Ek has established a reputation as a trailblazer in the Swedish culinary world. He and his partner Agneta Green opened their restaurant Oaxen Skärgårdskrog (shortened to Oaxen Krog) on the island of Oaxen in 1994. Not a “regular” restaurant, they focused on foraging and serving and cooking edible plants, something which was practically unheard of back then. The tiny island of Oaxen in the Stockholm archipelago is roughly 60 km southwest of the city. Whilst a beautiful location, it is isolated and frequently experiences some harsh weather conditions. In 2011, Magnus and Agneta decided to close up shop and relocated to a much more accessible location - the island of Djurgården, just a short way from downtown Stockholm and around the corner from the famous ABBA museum - where they reopened in 2013 as Oaxen Krog & Slip. On that note, the more I researched Chef Magnus and where he came from, the more amazed I became. I can’t believe it’s taken so long for the Baltics to be explored by the Caviar Crew! The area blows us away a little bit more every time we visit (which has been numerous times in the last 6 months!). Chef Magnus and Agneta also have a nice plot of land on Djurgården that allows them to nurture their own “Oaxen farm” from which they pull many of the ingredients used in the restaurants. 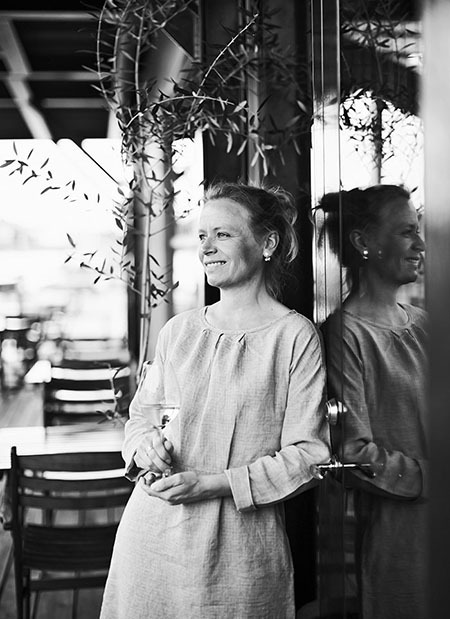 You and your partner Agneta Green opened Oaxen Krog before nature-inspired menus based around seasonal, local ingredients were popular. Did you receive a lot of pushback from colleagues and clientele when introducing Oaxen Krog’s concept? We started this thinking/philosophy when we opened our first restaurant on the island of Oaxen 1994. In the first years, it was of course seen as a bit odd. How has the Stockholm dining scene changed for you over the last 20+ years? For example, do diners receive your food and ideas differently then vs. now? What about the kitchen staff you hire? Well, for one thing, Stockholmians go out and eat and drink much more on weekdays than 20 years ago. The customers are much more educated, but the biggest change as I see it is that there are so many people with allergies. In your eyes, what does the Oaxen brand stand for—what’s the USP? We stand for a natural cooking (in the way we cook and how we cook). Oaxen Krog & Slip stands for honesty (the ingredients we use, conditions for staff and guests). We want to evolve but always be true to ourselves. We are an eco-friendly business with geothermic heating and cooling, compost for natural gas production. And most of our ingredients and farms that we work with are organic. How do you ensure that the back of house and front of house align beautifully to deliver an experience up to standards? So many things go past without notes! But we all try to check as much as possible and also educate staff and managers to question the quality of our work. Most culinary legends learn from other culinary legends. How did you learn your trade? Is there anyone you credit for shaping your career? I’m a very much self-taught cook but my biggest idol as a young chef was Erwin Lauterbach. In the Slip, we have signature dishes like our steak tartare, celeriac cooked in cheese whey with roe. But in the Krog we don’t have any signature dishes. We are more bound to the season in the Krog, so it is almost impossible to have a signature dish. The only thing that could represent a signature dish is our pilsner kavring (our dark brown bread served in a cast iron pan). That bread we had on the Oaxen Island and we have served it in the Krog since we opened on Djurgården. What’s one culinary trend you don’t care for? That it looks alive and that the ingredients that you taste the most are visible. How do you keep your team motivated and operating at high-level standards? Carrot and whip, but mostly carrot. Talk and look everybody in their eyes, smile, and pay attention to everybody. A shellfish stand in old Mazatlán, year 1992.
experience (good food, service, vibe)? A new cookbook is in my plan.